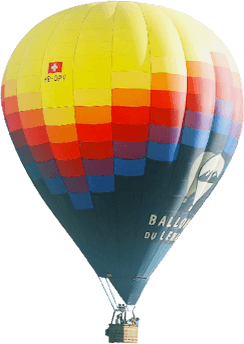 Geneva Lake region, one of the most beautiful balloon flying sites in the world. Discover the Swiss vineyards, Alps and lakes in an open air 360-degree view basket! A moment of happiness and freedom to share with family or friends. It’s the perfect gift for any special occasion! Enjoy the privacy of an exclusive hot air balloon flight for just you and your special guests. Our exclusive premium flights carry up to 12 passengers per balloon. This package is ideal for anniversaries, special occasions, romantic escapes… The Premium flight also offers more flexibility for dates and launch sites. A surprising experience where you combine gastronomy and ballooning. Fly and enjoy a meal prepared by a renowned chef and served in the highest restaurants. A gift idea that is both romantic and original. Take your teams and customers to new challenges! This flight is especially designed for your corporate events, team building, incentive, etc.